Two Rotary Clubs: Elstree and Borehamwood and the Studios, formed The Borehamwood Band Stand Committee. This committee is arranging a series of brass band concerts and other performances in Meadow Park, working in conjunction with Elstree & Borehamwood Town Council and Hertsmere Borough Council. This years concerts are scheduled to be on 30th June, 7th, 21st and 28th July 2019. 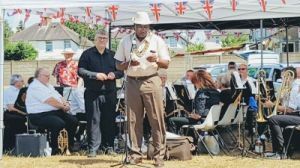 These Sunday afternoon brass band concerts are arranged so towns folk could see how having a facility in Meadow Park will be of benefit the wider community in Elstree & Borehamwood. Working with the London & Home Counties Brass Band Association, brass bands from Hertfordshire performed four separate dates. Other performers will be Soul Jump, a funky interactive animation band, Writers in the woods performed readings, the U3A ukulele Band, Strummers in the Woods. The Band Stand Committee are working with the Town and Borough Councils to provide a permanent Performance Space in Meadow Park in second phase of the Meadow Park refurbishment. The committee working with Elstree & Borehamwood Town Council as well as representatives from Hertsmere Borough Council to move things forward to design and built a permanent structure which will be fit for purpose, having all the necessary facilities required to make this arena to be used by different community groups.